Contractor Plans allow you to provide the ultimate customer experience to your clients. With a Contractor Plan attached to your account, you can directly access any of your customers’ controllers from your own account. This means that you can make changes to your customers’ controllers while on the road—you can switch between any controller with just two clicks. Imagine the time you’ll save by avoiding an on-site trip and the enhanced customer experience you can offer. From your Contractor Plan account, you can create new customers and controllers for those customers. When you create a new customer account, that customer is automatically linked to your account and you can immediately start managing their controller (or creating new configurations). You can also allow your customers to manage their own controllers (if you want to). Because we don’t require you to install a controller before configuring it, you can create controller configurations during downtime. Once on site, all you have to do is connect the controller to wireless and start testing your zones, so this can be a real time-saver. Each Contractor Plan account has a maximum number of customer controllers that can be managed. Contractor Plans start at five free controllers, but can scale to thousands of controllers under management. 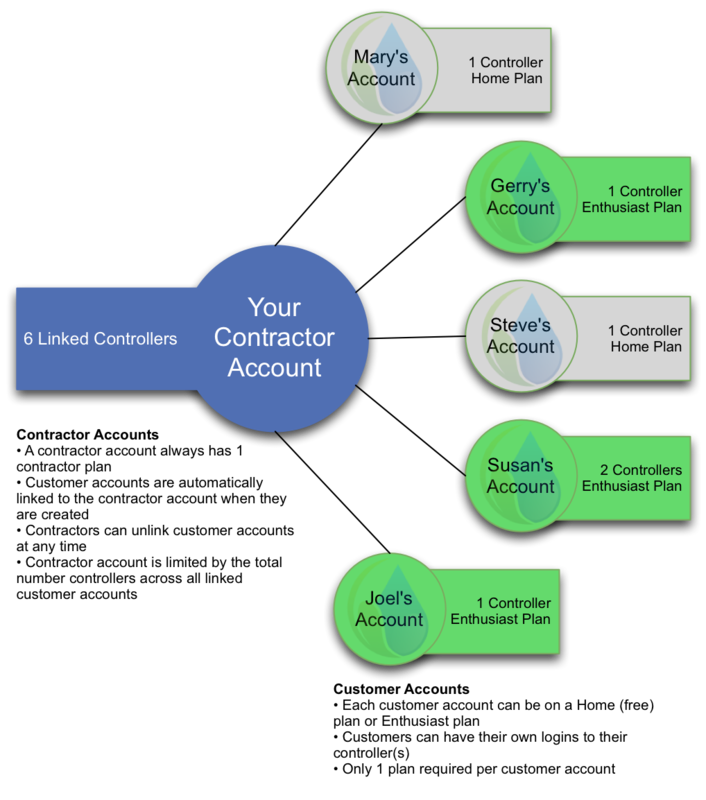 Each customer account that is linked to yours will have controllers that count toward your contractor plan limit. If you no longer want to manage a customer’s controller, you can remove that customer from your account and the number of linked controllers will go down. Each customer account will be on either the Home Plan or the Enthusiast Plan. If your customer decides that they want the enhanced features in the Enthusiast Plan, you can sell this to your customer and start earning recurring revenue. There are two types of alerts that a Hydrawise controller can send: flow-based alerts, and notifications about when the controller is offline or when a customer plan is set to expire. With a Contractor Plan, you can choose whether these alerts are sent to your customers or to you. Note that flow-based alerts will only be sent if a customer has a plan that supports these types of alerts (i.e., an Enthusiast Plan).